Toinen koti [Other Home]. Photo: Finnish National Theatre. In November 2017, the Touring Stage of the Finnish National Theatre premiered a production called Toinen koti [Other Home] in its Omapohja Studio, performed by a group of native Finnish and refugee professional actors, though also including refugee performers with no professional training. 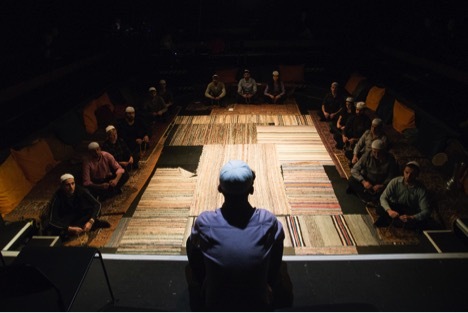 Part of a nationwide Arts Equal research project examining the lives of refugee artists in Finland, the play was based on the experiences of the participants, and focused particularly on encounters between Finnish and Arabic culture. This was the Touring Stage’s second project with refugees. In 2011, a year after being founded, it carried out a three-part project called Vastaanotto [Reception]. The first phase consisted of field work, which then led to a theatre performance called Paperiankkuri [Paper Anchor], performed on the Small Stage of the National Theatre. 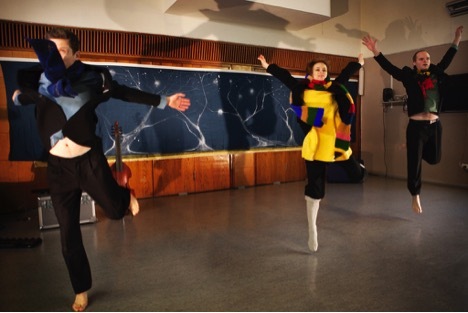 The third phase, a performance called Paperisilta [Paper Bridge]–featuring the dancer Nina Hyvärinen, actor Jussi Lehtonen and musician Mikko Perkola–toured around immigration reception centres in Finland. During these visits, a workshop-type performance entitled Paperihiiri [Paper Mouse] was arranged for centre residents under the age of ten. These tours were arranged in cooperation with the Finnish Immigration Service, the Finnish Red Cross and the Central Union for Child Welfare. The project was a conscious gesture on the part of the Finnish National Theatre to provide opportunities for contacts between immigrants and the majority population. Paperiankkuri [Paper Anchor]. Photo: Nico Backstrom. In Finland, the social and political context of immigration changed radically in 2015. While the number of asylum-seekers arriving to the country in 2011 was about 4000, in 2015 it was over 32,000 (in a country with a population of 5.5 million). When Other Home was performed in 2017, Finns throughout the country had begun encountering newcomers in their own neighbourhoods, as individuals or in groups, whereas earlier refugees had been visible mainly through the media. As immigration began to have more local consequences, theatre, too, began to have new options. As public officials sought to handle the unexpected growth in asylum-seekers, the government tightened interpretations of legislation, press and public circles became activated, and attitudes grew more polarized. The Immigration Office was criticized for its refusals to grant asylum, including by the production Other Home. While the earlier Paper Anchor featured amateur performers playing the asylum seekers and had a documentary quality, the focus in Other Home was more on equality between professional artists, no matter their country of origin. Discussions of asylum and refugees have generally been based on categorising: a refugee is a kind of archetype, a figure created by government practices, international law and humanitarian activities, separate from his/her own social contexts. This was also very true in 2017, and Other Home was viewed in this context. At the same time, however, due to its documentary character (as in refugee theatre more generally) and through other strategies, Other Home challenged power relations and worked against these prejudices. Equality between the artists–native Finns and refugees together on stage–already worked against the categorization of refugees as helpless or separate from their social contexts. The production devised innovative strategies for depicting Finnish society and official refugee politics. 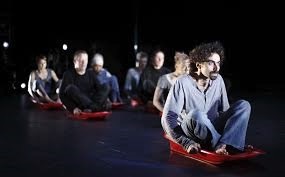 In keeping with the play’s documentary character, refugees mainly performed themselves and Finnish actors spoke most of the lines drawn from official documents, but the roles were also mixed, and Finnish and foreign customs and culture collided in both expected and unexpected ways. For example, a refugee rap artist, Saroush Seyedi, performed a parody of the Prime Minister of Finland. In another scene, an immigration officer does not know who Samuel Beckett is when a refugee actor, Bakr Hasan, mentions that performing in one of Beckett’s play caused such hatred and threats that he was forced to flee his home. A song by Ali Saed was based on traditional music in his home country, but also occasionally adapted traditional Finnish songs, testifying to his artistic talent as well as making compelling use of cultural traditions. Alison Jeffers has said that theatre provides a limited space in which to examine moments of encounter, and indeed the small Omapohja studio functioned well as a place where “the native and the diasporic subjects are founded.” Performers and spectators shared the space without a visible demarcation line, as eighty seats surrounded the stage and provided close access to the actors. 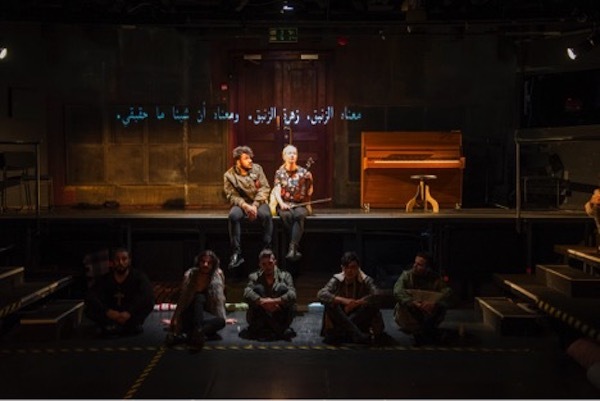 The production was multi-lingual: Finnish, Arabic and English were spoken, and Finnish and Arabic text was projected onto the walls. The scenography was also culturally mixed. According to reviews and audience reactions, Other Home touched spectators deeply, with people being especially moved by the talent of the performers and the way in which they told their stories. The play seems to have succeeded in challenging power relations and questioning government practices. In emphasizing the artists’ individual talents while also working to create an ensemble, the production foregrounded what is too often forgotten, the need for equality and the pitfalls of categorising. Paper Anchor and Other Home represent a new policy of the Finnish National Theatre, as the stated aim of the Touring Stage is to promote social equality and well-being through art. The Stage takes productions to people in locations which have little or no access to live art, and its repertoire is available for hire by health care and social institutions, prisons and immigrant reception centres. It develops its projects through interaction with different kinds of marginalized groups and creates socially-inclusive documentary theatre. Its goal is to give voice to marginalized groups and engage in societal discussion through art. Under the umbrella of the Finnish National Theatre, these functions get additional legitimacy, special visibility and status. And in turn, the theatre’s own symbolic social and cultural capital can also grow. The actor and scholar Jussi Lehtonen has been managing director of the Stage from the beginning, and art for new audiences has long been a priority of his. For example, in addition to being part of the permanent ensemble of the Finnish National Theatre, he also developed a solo show of Shakespeare’s sonnets which toured in social institutions and prisons. His doctoral dissertation In the Same Light: Acting in Care Institutions, which discusses different forms of contact between actors and spectators in performances in care institutions and prisons, grew out of this work. Working with prisoners was also one of the first projects of the Touring Stage. In 2018, the Touring Stage arranged a workshop for young people in selected schools to work on a new adaptation of Dostoyevsky’s Crime and Punishment, with the goal of helping them deal with some of their more painful experiences. In addition, two musicians from Other Home, Ali Saed and Sanna Salmenkallio, will tour a joint music show around the country. Other Home and Paper Anchor are documentary theatre focusing on immigration and refugees, where some of the performers have experienced the events in their own life, and part of the goal is to conduct field research and document these experiences. Other Finnish theatres have also discussed refugees and asylum-seekers, though so far only a small number of plays on the topic have been staged. The work by the Touring Stage alone cannot fill the gap, and its projects have reached just a small fraction of the theatre’s potential audience. And as noted above, the Touring Stage has other priorities as well, bringing art to other marginalized groups. These productions on the theme of immigration, however, add new voices to the general discussion and draw attention to grassroots efforts to improve the lives of refugees and asylum-seekers in Finland. And for the communities of the refugee performers, their impact may be significant indeed. Professor Emerita Pirkko Koski was responsible for the Department of Theatre Research in the Institute of Art Research at the University of Helsinki, and the director of the Institute of Art Research until the end of 2007. Her research concentrates on performance analysis, historiography, and Finnish theatre and its history. She has also edited several anthologies about Finnish theatre, and volumes of scholarly articles translated into Finnish.